Growing under pines in eastern North America, this funky mushroom seems almost like a cross between Lactarius indigo and Lactarius deliciosus. 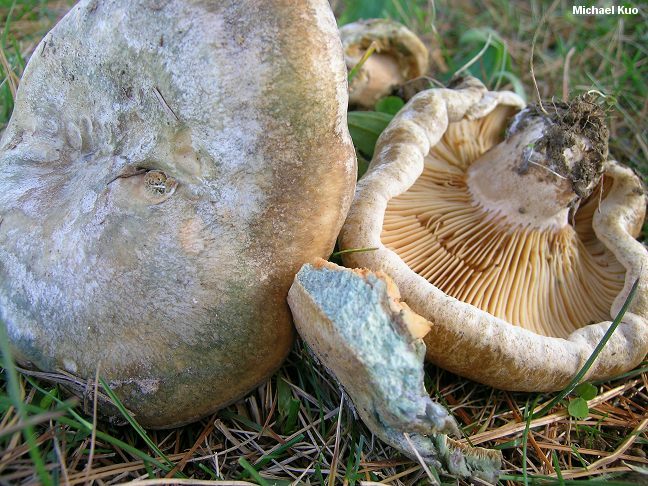 With Lactarius indigo it shares the gorgeous blue color of the exposed flesh--and when very young, its cap is often a pale bluish shade. 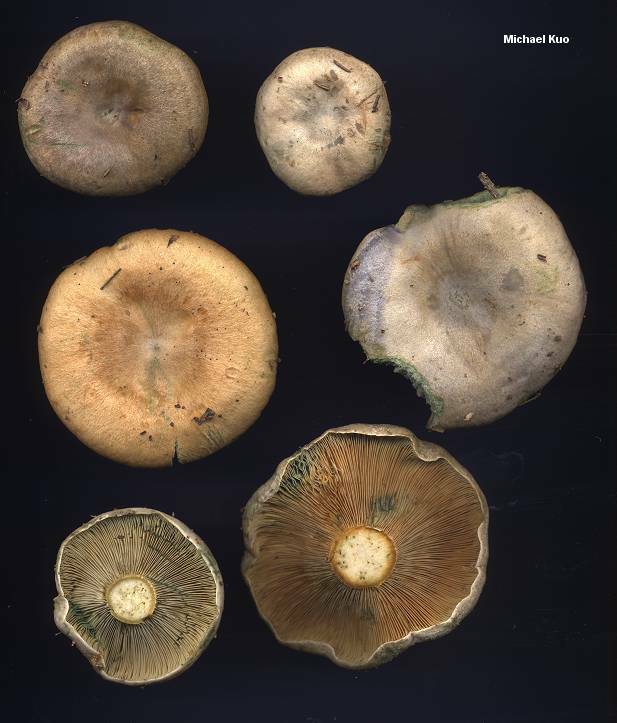 As Lactarius chelidonium var. chelidonioides begins to mature, however, its cap goes through a series of bewildering color changes--from a dingy yellowish brown to a dull orange, bruising and discoloring strongly dark green. 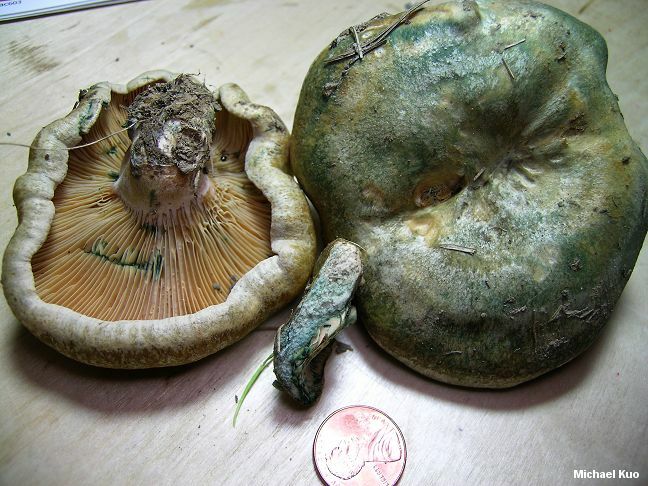 When orangish and bruising green, it is reminiscent of Lactarius deliciosus. 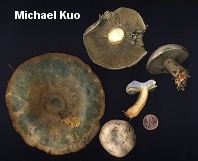 Eventually, in older specimens, the cap may become dark green overall. Ecology: Mycorrhizal with pines, especially eastern white pine and red pine in young plantations; September, October, and November; distribution uncertain but probably fairly widely distributed in eastern North America. Cap: 3-12 cm; convex becoming planoconvex to shallowly depressed or shallowly vase-shaped; sticky when fresh, but soon dry; bald or very finely appressed-fibrillose; often finely roughened; dirty bluish when young, passing through stages of yellowish brown and dull orange; often mottled with watery spots of color; readily bruising dark green; in age often green overall; without concentric zones of color, or with faint zones near the margin. 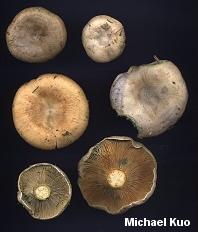 Gills: Beginning to run down the stem; close or fairly crowded; pale yellowish when young, becoming dirty yellowish to dull orange or brownish; bruising and discoloring green. Stem: 2-6 cm long; 1-3 cm thick; tough; more or less equal; dry; fairly smooth; without potholes; colored like the cap or paler. 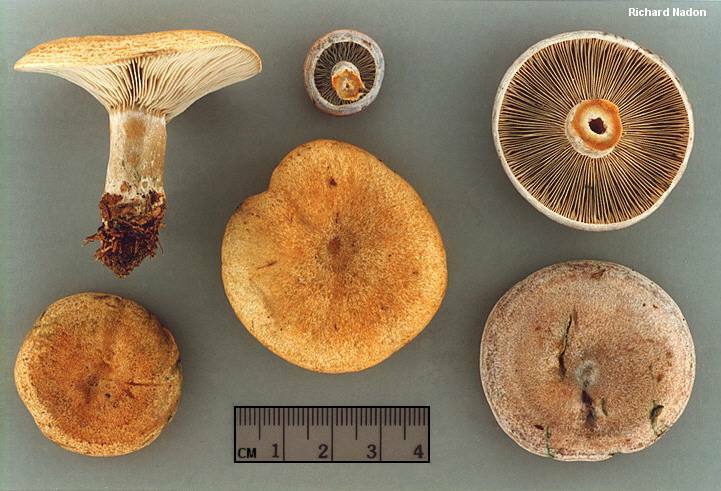 Flesh: Sky blue in the cap; paler elsewhere; sometimes orange in the stem, especially at the base and near the cortex. Milk: Very scant (likely to be observed only in very young buttons); dirty yellowish to yellowish brown; staining tissues green; staining white paper yellowish. Odor and Taste: Odor fragrant or, according to Hesler & Smith (1979), reminiscent of yellow morels (I have never noticed this parallel); taste mild or slowly slightly peppery. 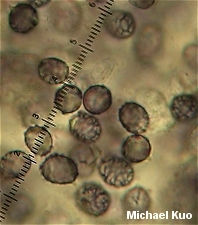 Spore Print: Pale buff to yellowish or orangish. 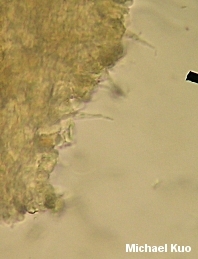 Microscopic Features: Spores 7-9 x 5-7 µ; broadly ellipsoid; ornamentation 0.5-1 µ high, as amyloid warts and ridges forming partial reticula. 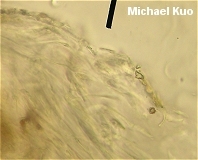 Pleuromacrocystidia sometimes absent; when present scattered; fusiform; to about 50 µ long, or occasionally longer. Cheilomacrocystidia similar but shorter; usually present and scattered to abundant. Pileipellis an ixocutis. REFERENCES: (Smith, 1960) Hesler & Smith, 1979. (Peck, 1872; Peck, 1885; Saccardo, 1887; Coker, 1918; Smith, Smith & Weber, 1979; States, 1990; Phillips, 1991/2005; Roody, 2003; McNeil, 2006; Nuytinck et al., 2006; Nuytinck et al., 2007.) Herb. Kuo 11149401, 09299601, 09280306, 11030901. States (1990) illustrates and briefly describes a similar and apparently undescribed species under pines at transition elevations in the southwestern Rocky Mountains. If you are wondering how the mushroom in Peck's descriptions differs from the one I am describing and illustrating here--well, so am I. While Peck described the milk as "mild" in both descriptions, Hesler & Smith say the milk of var. chelidonioides is "tardily and slightly peppery." Then there is the odor: not mentioned by Peck in either description and, therefore, presumably not distinctive--versus "subnauseous, like that of Morchella esculenta" for var. chelidonioides. 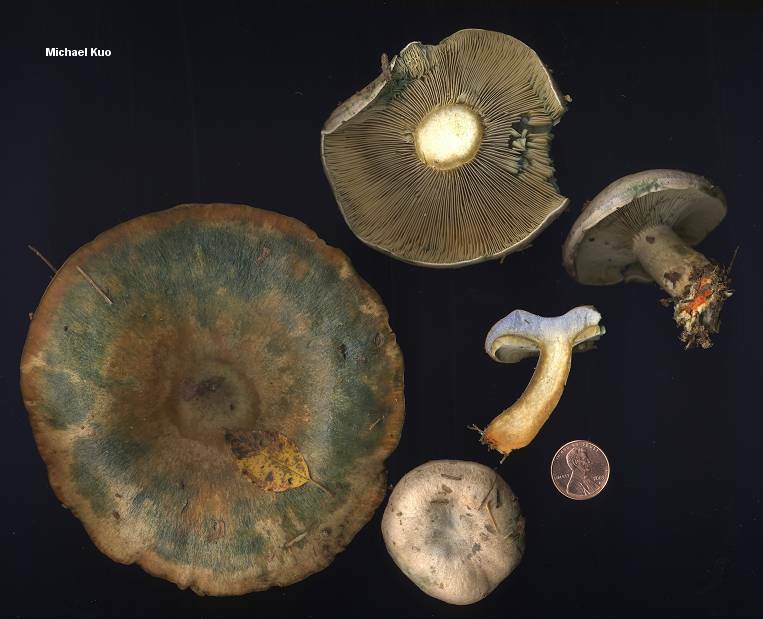 (My collections have all smelled mildly fragrant, the way many Lactarius species do.) The color of the milk is described by Hesler & Smith as "dingy yellow to yellow-brown" for var. chelidonioides. Peck was quite taken with the color of the milk in his descriptions, and he named the species "chelidonium" to reflect the fact that the milk looked like the juice of celandine (Chelidonium majus), a European flowering plant introduced to North America with a poisonous juice once thought to remove warts and cure liver ailments, apparently because the juice is colored like bile. Yuck. Anyway, Peck italicized "saffron-yellow" in his 1885 description, and Wikipedia's entry for saffron (Peck had Wikipedia, didn't he?) tells us the Hex triplet (used for colors on computers) for the color is #F4C430, which looks like this. Do those letters look dingy yellow to you? Yellow-brown? Like bile? Like grasshopper spit? 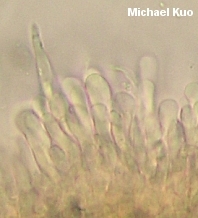 Microscopic distinctions (including the height of sporal ornamentation and the frequency and anatomy of macrocystidia) do not separate the two taxa, in my opinion, since they appear to vary even within a single collection and may merely represent specimen maturity and/or years in the herbarium.